(A) A Plat Exhibiting the State of the Surveys in the State of Florida with References. 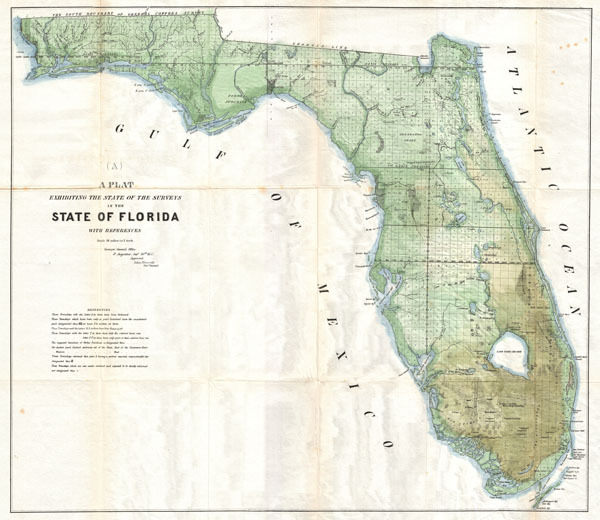 An exceptional example of the 1853 Land Survey Map of Florida. This map represents the state of the Land Survey in Florida as of September 30, 1853. Shows the state divided into several hundred numbered plats, some of which are marked with an 'S' to state that they had been fully surveyed, and some with a 'T' suggesting that they had only been surveyed externally. Labels several important Seminole War Forts including Fort Bassinger, Fort Center, Fort Thompson, Fort Beynaud, Fort Adams, and others. Notes the Everglades, Big Cypress, Fort Lauderdale, Lake Okeechobee, and many of Florida's lakes and river systems. The map is dated to 1853 and attributed John Wescott, Surveyor General. Wescott (here misprinted as Wescoll) took the office of Florida Surveyor General in 1853. He is known to have issued two map of Florida to accompany his annual reports - this is the first. The second, in 1854, represents a major update and add an inset of the Florida Keys. Very good condition. Minor toning on original fold lines. Blank on verso.